Learning New Testament Greek is a difficult task, but the lifetime rewards are well worth the effort. Many serious students of the Bible have started on the path to learning the language only to be frustrated by the inherent difficulty of the task or the pace of their classroom instruction. Biblical scholar and computer expert Ted Hildebrandt has harnessed the power of the computer to develop multimedia, interactive Greek learning tools that have helped thousands of people learn the language of the New Testament more effectively. He now offers an enhanced programme that can be used as a primary or supplementary classroom text, for self-instruction, or as a refresher course in New Testament Greek. THE HEART OF MASTERING NEW TESTAMENT GREEK is an interactive tutorial program built around twenty-eight lessons that walk the student through the basics of Greek vocabulary and grammar. Each lesson teaches the basic information that would be found in any Greek grammar. In addition, the student has the opportunity to drill concepts through multiple choice exercises that provide immediate feedback. Chapter exercises deepen the student's comprehension by requiring detailed spelling of Greek words, again with immediate feedback. Finally chapter reviews provide charts and memory verses for quick review. In addition to the twenty-eight chapters of interactive instruction, the tutorial program includes a vocabulary builder, an easy reader from the Greek New Testament, and standard paradigms and charts. The interactive programme is supplemented by more than 700 pages of electronic books in printable format, including a traditional Greek grammar, a workbook with exercises for each chapter, a vocabulary builder to aid memorization, and a basic Greek-to-English dictionary. Students can print out pages as necessary. Mastering New Testament Greek can be used effectively in the classroom as a total Greek learning solution or as a supplemental tutorial for students needing extra help. For instructors adopting this program as the primary textbook for class, instructor helps, including an answer key and PowerPoint presentations, are available. Mastering New Testament Greek is also an effective "teach yourself Greek" or Greek refresher course. From Baker. 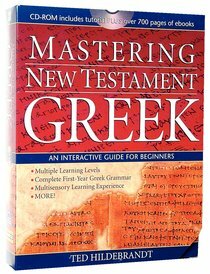 About "Mastering New Testament Greek CDROM"
A comprehensive, interactive guide for beginners on how to learn New Testament Greek. Includes a Greek grammar, workbook, vocabulary builder, and dictionary. Ted Hildebrandt (Th.D., Grace Theological Seminary) is professor of biblical studies and Greek at Gordon College. His interactive Greek and Hebrew tutorial programs have been used by thousands of students to enhance their language-learning experience. He is also the developer of Get Lost in Jerusalem, a virtual reality CD-ROM.